Any junior cricketer that turns up in their club cricket top will get FREE entry on Saturday. Devon Conway – Super Smash leading run scorer. Jan 6, 2019 –A powerful Firebirds team performance built on aggressive batting from Michael Bracewell and Adam Hose, four wickets on T20 debut for Ben Sears and some extremely sharp fielding got the Firebirds the win in front of over 3000 Wellington fans. Jan 7, 2018 – Canterbury Kings put on 150 runs, with Chad Bowes top scoring on 41. Then it was Ed Nuttall who dismissed the powerful Luke Ronchi with a royal duck as he went on to make his best T20 bowling figures of 3-13. Jamieson also nabbed 3 wickets as the Firebirds eventually were all out for just 88 runs. Canterbury Kings: Cole McConchie (c), Jeremy Benton, Chad Bowes, Leo Carter, Andrew Ellis, Cam Fletcher (wk), Kyle Jamieson, Todd Astle, Steve Murdoch, Ed Nuttall, Henry Shipley, Will Williams. Wellington Firebirds: Hamish Bennett (c), Tom Blundell, Michael Bracewell, Devon Conway, Lauchie Johns, Ollie Newton, Malcolm Nofal, Jeetan Patel, Rachin Ravindra, Ben Sears, Logan Van Beek, Luke Woodcock. City Mission: Last year the Christchurch City Mission transformed the lives of almost 30,000 people across Canterbury. That’s almost 4 times the number of people it takes to fill the Hagley Oval! Please show your support by bringing a can of food to the game on Saturday. Let’s help them feed those in need! Grab your playing card on the gate, and if your “Super Smash Play” happens, make your way to the Cricket Express merchandise tent for a prize. Pick up some discounted Kings Merchandise at the Purple Dynasty Sport / Cricket Express tent at the top of the Embankment. It’s our last game so grab a bargain! 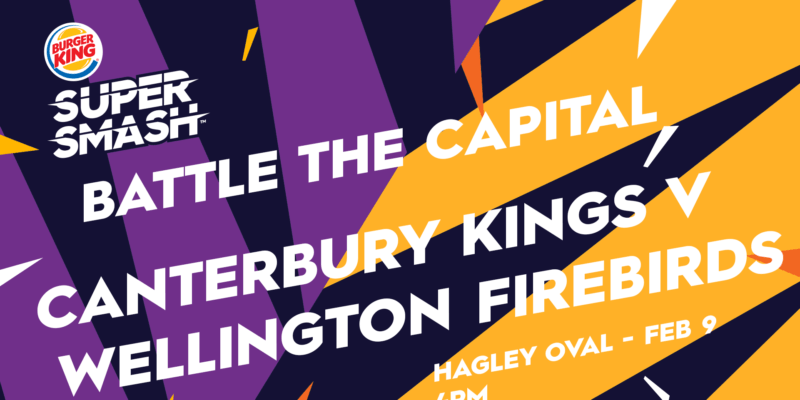 Catch all of the Canterbury Kings and Wellington Firebirds players after the game to the left of the pavilion.